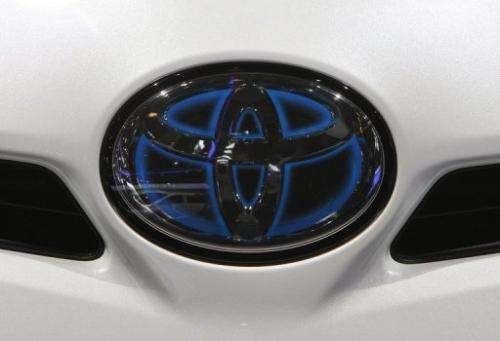 Japanese automaker Toyota has decided to join German rival Daimler in boycotting a new air-conditioning coolant deemed more environment-friendly in Europe, Toyota's German unit told AFP on Friday. Toyota will revert to an older coolant for its Prius Plus, Lexus GS and GT86 models in Europe, said a spokesman for Toyota Germany. Since January 1, EU norms demand that car makers use refrigerants that are more environment friendly in new types of vehicle and European automakers decided to that one called R1234yf meets those standards. The makers of R1234yf reject Daimler's claims. "Toyota regards it as the duty of individual companies within the automotive industry to ensure that vehicles meet current safety standards," Toyota Germany said in an emailed response. "Unfortunately, there is no consensus on this issue on the European market. For this reason, we have decided, as a temporary measure, to use R134a so as to dispel any possible concerns our customers might have," it said. Toyota had conducted internal tests with the coolant R1234yf and found "no safety concerns," it said. The sale of vehicles with R1234yf had only begun after "complete confirmation of their safety." Nevertheless, "it is of the highest priority for us that our customers feel safe in their vehicles. As soon as the situation has been clarified and a consensus found, we will comply with outcome," Toyota said. The spokesman declined to say how many Toyota cars might be affected. Green carnage. Green recession. Nothing to see here, folks. Taking spinning crucifixes away from greenies is as hazardous as trying to convince women that blood diamonds are just abundantly boring carbon at monopoly prices. Just try it and they inqui$itionally $hake their green holy water flask$ at you! Before ozone hole was news, the propellant used in spray cans was some CFC compounds. After it was discovered that those are harmful to upper atmosphere ozone, they were replaced with more ozone friendly substances like propane and butane. Unfortunately those are also used as lighter gas, which means they are highly flammable. The lesson here is that no single substance has all the good properties and none harmful or undesired ones. So if refrigerant is changed to maximize some properties, there are going to be other properties that are not as good as in the old stuff. Like greater flammability. So your argument is to never change to anything better because nothing is perfect? No. But people must recognize that one can not expect to optimize one aspect like eco-friendliness without considering other aspects that take a hit at the change. For example we could ban mercury use altogether, but that would mean that fluorescent lamps would be banned too as they can not function without mercury. Then people might return to incandescent lamps, which would result into more mercury pollution, because the greater electricity use would mean more coal burned, which would release as byproduct mercury pollution, as all coal burning does. So when considering any change, all the resulting changed areas should be weighted before claiming that one solution is the best. Typically there is different solution for each niche and there is no universal right solution. Nothing to see here, folks. . . .
Whew! Yet another of your stream of consciousness rants. I'm trying to connect the dots here. You have noted your academic focus was organic chemistry. So you could easily synthesize a variety of psychotropic substances? R1234yf releases hydrogen fluoride gas when burned, which converts to hydrofluoric acid on contact with water. It's kinda nasty. You wouldn't want to inhale the fumes in case of an engine fire. Because of the ability of hydrofluoric acid to penetrate tissue, poisoning can occur readily through exposure of skin or eyes, or when inhaled or swallowed. (...) Once absorbed into blood through the skin, it reacts with blood calcium and may cause cardiac arrest. Actually, R134a also releases HF. Both molecules, R1234yf and R134a contain 2 hydrogen atoms and 4 fluorine atoms, so both have an equal potential to generate HF. Thanks for clarifying. I think everyone agrees on the importance of analyzing the impact of change. This argument is so silly. I have seen one engine fire in the last 40 years, at 0 mph--- in a parked car. Ozone everywhere, methane bubbling from each fracked well at a great rate and you people are fussing about miniscule events. with less than miniscule problems/releases. DUMB!